Final event in the "16th Annual Music for People & Thingamajigs Festival" at Meridian Gallery, San Francisco, CA on Saturday, October 12, 2013. Final event in the "16th Annual Music for People & Thingamajigs Festival" at Berkeley Arts Festival, Berkeley, CA on Monday, October 14, 2013. Sudhu Tewari is an electro-acoustic composer, improvisor, and tinkerer in sound, kinetic and interactive art. He has been called a professional bricoleur, junkyard maven and young audio-gadgeteer. Realization of John Cage's Fontana Mix documenting the process of experimenting and constructing elements of the Prepared Player Piano Pinball system. An early interest in disassembling alarm clocks and coffee makers gave rise to electro-acoustic instruments constructed with the remains of discarded stereo equipment, kinetic sculptures and sound installations. Sudhu builds audio electronics, acoustic instruments, kinetic sculptures, interactive installations, wearable sound art and recently began working with bicycles with wide variety of end results. Highly educated at Mills College in electronic music, Tewari has been seen performing improvised music in various configurations with the likes of Fred Frith, Cenk Ergun, Mark Bartscher, Tadashi Usami, Gunda Gottschalk, Eric Glick-Rieman and Shelley Burgon. Normal is Fred Frith and Sudhu Tewari, playing manually & electronically manipulated home-made instruments. In October 2006 Sudhu spent four months at the Artist in Residence program at the San Francisco Dump, crafting interactive installations, kinetic sculpture, lamps, and objects d’art from other people’s trash. The residency culminated in a gallery show in January 2008. Since then, Tewari's visual and interactive art has been exhibited at Swarm Gallery, 21Grand, ProArts and FLOAT Gallery in Oakland, California, Montalvo Arts Center in Saratoga, California, at UC Santa Cruz in Santa Cruz, California and at PROGR in Bern, Switzerland. Fred Frith performs improvisations at the 11th Other Minds Music Festival at San Francisco's Yerba Buena Center for the Arts, 2005. 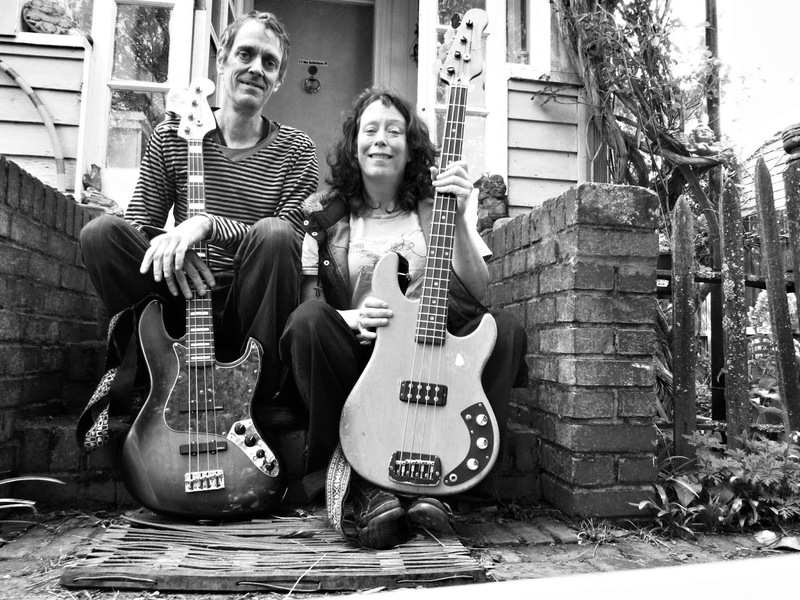 Frith performed at the festival both as a soloist and as a member of the due Normal, alongside Sudhu Tewari, a Bay Area resident of Indian descent whose remarkable music is performed on homemade acoustic instruments. In 2007, Tewari collaborated with percussionist Kelvin Underwood on a project that integrated Taiko drumming with electronics, noise and chaos and incorporated Capoeira and Maculele movements. Sudhu has been seen performing as a modern dancer with GroupA , the brainchild of choreographer Alyssa Lee Wimot. Tewari also collaborates with Alyssa Lee to create light installations, costumes and wearable sound art devices for GroupA performances. In 2008 Tewari joined forces with Nuria Bowart and Melissa Crago to form SuDoNu, a performance art company focusing on developing new forms of movement and interaction arising from improvised play and spontaneous ritual to create meaningful interactions with an audience. Tewari spent the majority of 2008 in Switzerland, working as project manager for Radio Village Nomade an online sound project of Laboratoire Village Nomade culminating in a sound play aired on Bavarian National Radio. During his residency Sudhu also participated in several collaborative art residencies with artists from around the world. In 2010 Sudhu collaborated with sculptor Bryan Tedrick to create an interactive light and sound installation to “breathe life” into Tedrick’s 50 foot tall climbable steel sculpture, Minaret. The Minaret was installed at Burning Man 2010 and well received. Tewari’s installation took input from climbers on (and inside) the Minaret via microphones, light sensors and motion detectors and used the movement and interactions of climbers to control the lighting on the exterior of the Minaret. Sound elements, pre-recorded sound/music and electro-acoustic instruments in the base of the Minaret, were also controlled by the actions of climbers. Tewari is currently a graduate student at UC Santa Cruz in the Cultural Musicology PhD program and the Digital Art and New Media MFA program. Tewari has also been working as a project manager for UCSC’s OpenLab, a network for collaborative discourse fueled by academic communities, arts and science communities, and industry. Tewari also leads AUX, a collaborative research group focused on sound producing kinetic art and works with the Mechatronic project group in the DANM department. The duo Emily Remembered is formed by Deirdre Cartwright and Kathy Dyson. The two women have both gained an international career in various formations. 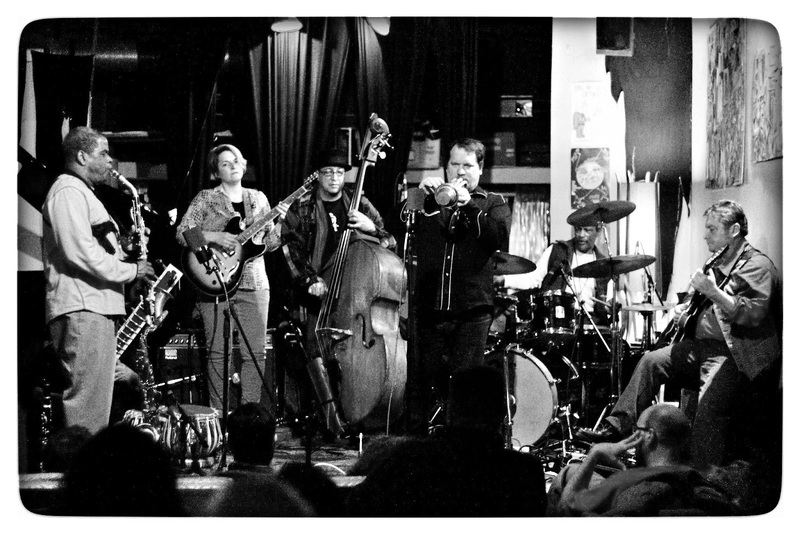 They represent a rara avis in the British jazz landscape, predominantly male. 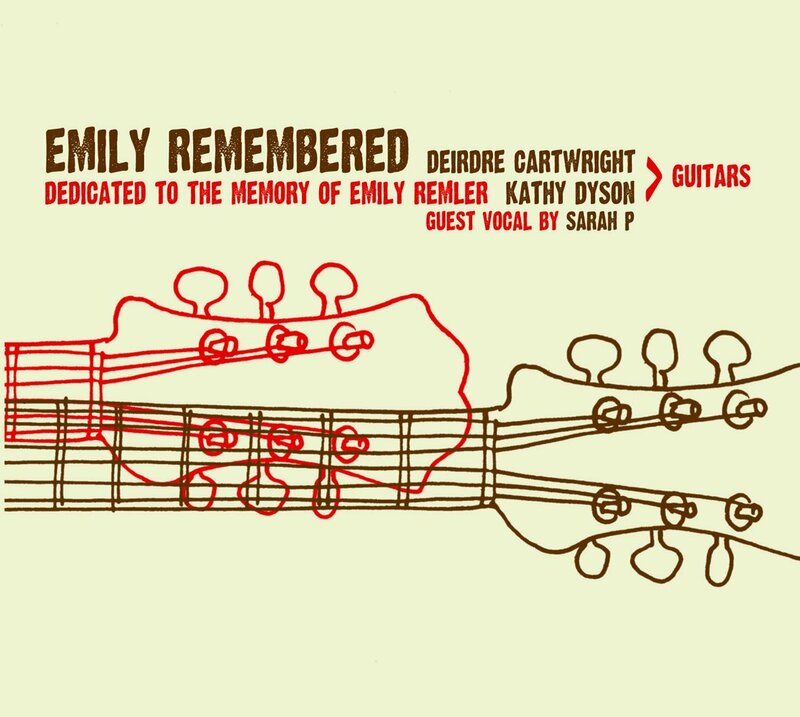 Armed with this exceptional status, Deirdre Cartwright and Kathy Dyson launched the Emily Remembered project to honor the great New Yorker that was the guitarist Emily Remler. 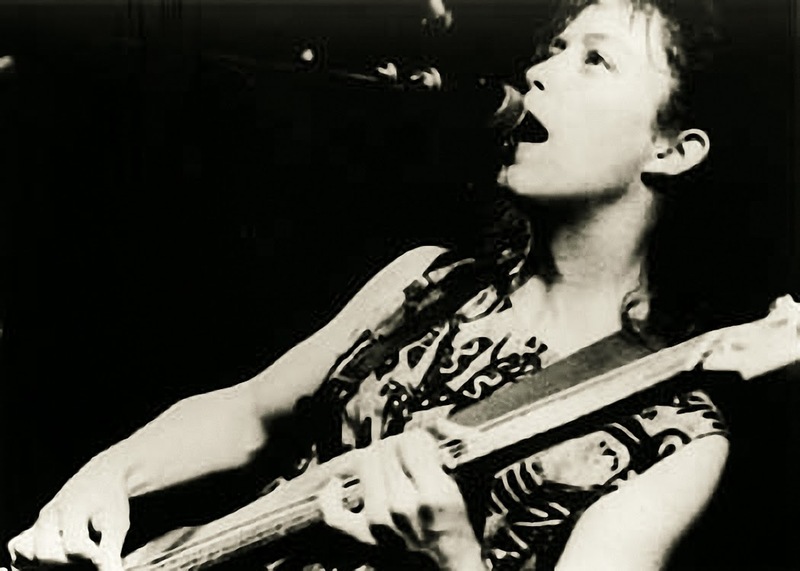 Born and brought up in London Deirdre Cartwright bought her first electric guitar when she was fourteen; however she had to keep her ambition to play in a band a secret from the nuns at her convent school. Mainly self-taught, she discovered the sounds of blues and jazz, and from the age of 17, began to play with a variety of bands from rock to big band jazz. In 1991 Deirdre formed her own group, The Deirdre Cartwright Group. As a solo artist she has played with American guitar legend Tal Farlow, toured with Jamaican composer Marjorie Whylie, and has played throughout Europe. She has also seen the regular jazz club she co-runs Blow the Fuse become one of the most popular in London and has been a regular presenter for BBC Radio 3. 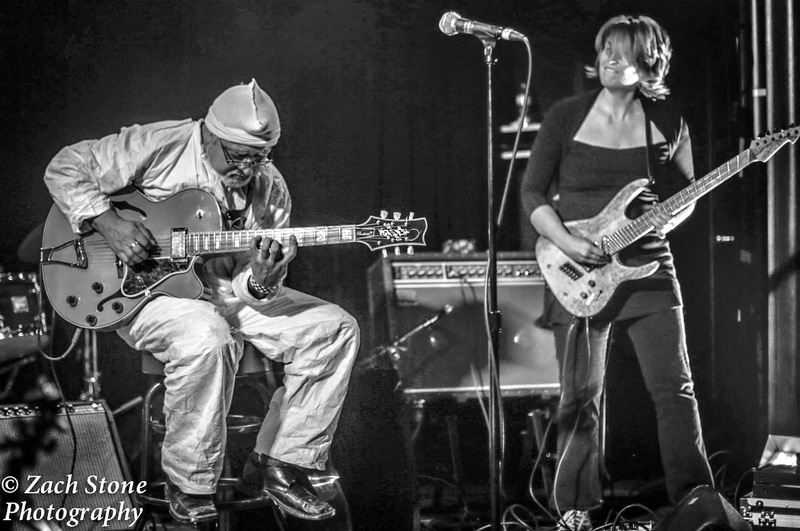 Kathy Dyson is a jazz guitarist, composer, researcher and educator based in Manchester. 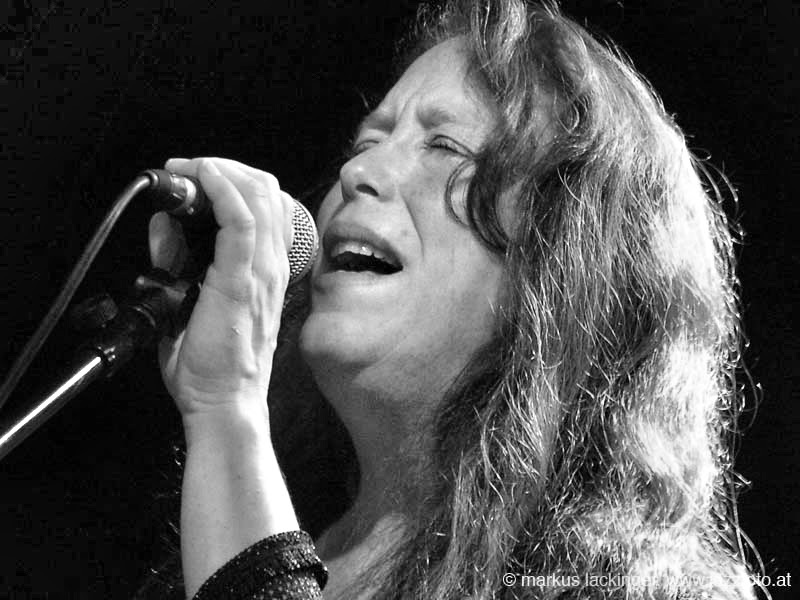 She first studied at Leeds College of Music in the early 80’s, co-founded Leeds Jazz, then set off on a five year tour of Europe with her husband John and daughter Ruth. They performed at the Sorgues, Ulm (in Germany) and Avignon Festivals, were taken in by the gypsy communities in the South of France and Germany and performed at gypsy clubs and gatherings. They also played for innumerable private parties and functions including riverboat trips down the Rhine and busked under the disapproving stare of Beethoven to an audience of 600 in Bonn. Currently she plays the Inside Outside jazz duo with John Dyson, and a quintet called John Dyson’s jazz Police with John Dyson, Martin Longhawn, Steve Hanley and Tom Riviere. Accompanied by the London Festival Kazz vocalist Sarah P., the duo alternates compositions of their idol, jazz standards and own works. A nice patchwork at the confluence of genres. 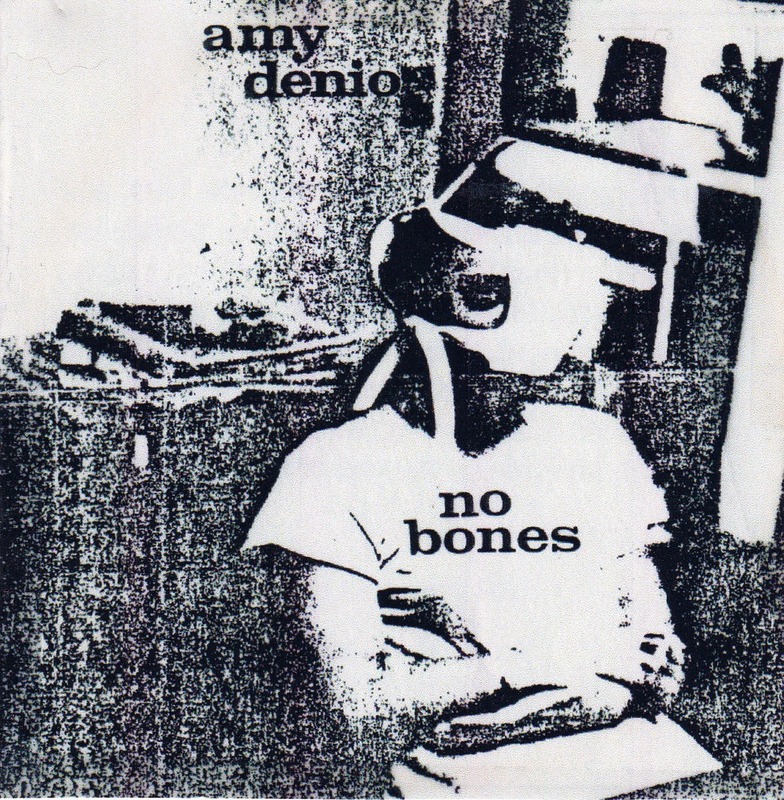 Amy Denio is a composer, singer, multi-instrumentalist, audio engineer, international collaborator, and record producer. Her main instruments are voice, accordion, alto saxophone, clarinet, electric guitar, and bass, and she's a budding thereminist. 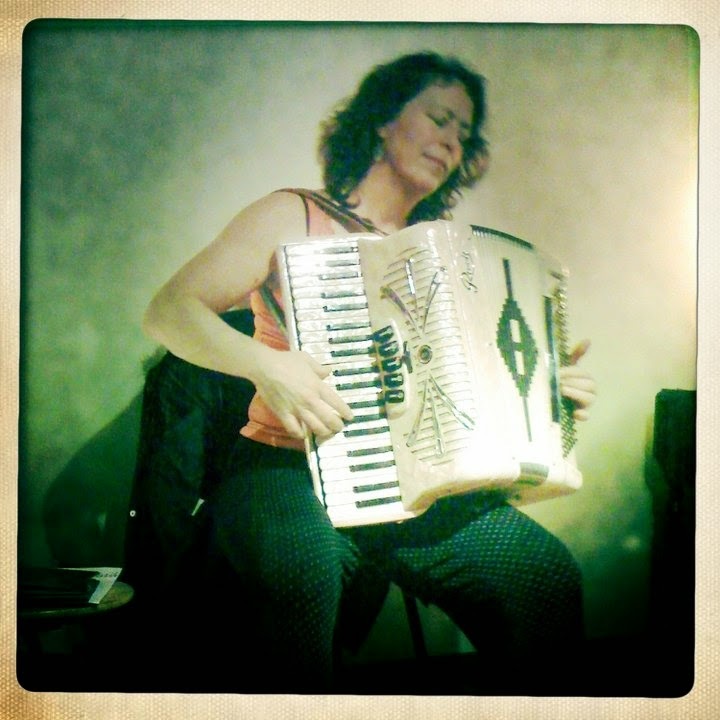 She has played at festivals, churches, schools, prisons and mercury mines throughout East & West Europe and North America, as well as in Taiwan, Japan, Hong Kong, India, Brazil, and Argentina. Her collaborative efforts have been seen and heard at Carnegie Hall, the Brooklyn Academy of Music, Seattle Opera House, Detroit Institute of Art, Venice Biennale, Roman Theater Trieste, and on top of 3 Metro Busses in Seattle. Home-taper since the Dark Ages of Analog, she started her label and publishing company Spoot Music in 1986, with the release of her first cassette, ‘No Bones.’ Since then, she’s recorded & released other cassettes, LPs and 35+ CDs created solo and with an array of international musicians. She's a founding member of Tone Dogs, The Tiptons (formerly Billy Tipton Memorial) Saxophone Quartet, Danubians, Pale Nudes, Lao Tse and The Entropics, Quintetto alla Busara, her Italian chamber/kitchen quintet, and Ama Trio. She has recorded and toured with Bosnian gypsy-core group Kultur Shock since 1999. She has also collaborated, recorded and toured with Austrian trio Die Resonanz Stanonczi, The Science Group (Stevan Tickmayer/ Chris Cutler/Fred Frith/Bob Drake, etc), Curlew, and she also collaborates with pan-Latin duo Correo Aereo. 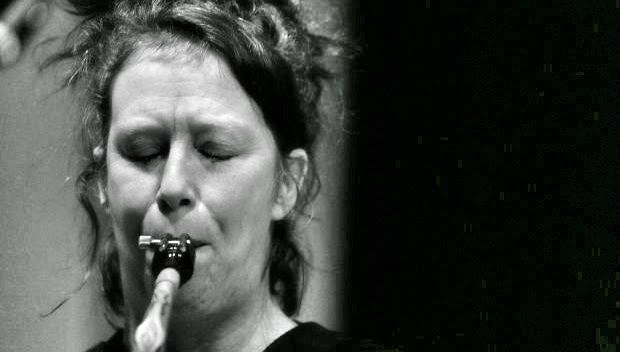 She has toured solo and has played with various groups and musicians such as Francisco Lopez, Danny Barnes, Relache Ensemble, Faust, Fred Frith, Matt Cameron, Bill Frisell, Chris Cutler, Guy Klucevsek, Pauline Oliveros, Hoppy Kamiyama, Ronin, Il Parto delle Nuvole Pesanti and has played with Chuck D's Fine Arts Militia. Denio's music was included in the John Cage Retrospective at the 1993 Biennale di Venezia. She has been a long-time collaborator with David Dorfman Dance; she received a Bessie Award for Composition (NYC) for her soundtrack to Dorfman’s piece 'Sky Down,' and premiered new music at Brooklyn Academy of Music ‘Next Wave’ 2000 series for Dorfman’s piece ‘To Lie Tenderly’. She scored 2 animated films by Thomas Edward ~ 'Pangaea's Brood' which won 'Best Animated Film' at the 1999 NY Underground Film Festival, and 'Synchrony in Estrus' which won 'Strangest Film' at the 2003 Motion Arts Festival in California. She also scored Jamie Hook's feature film 'The Naked Proof,' which received honourable mention at its premiere in the 2003 Seattle International Film Festival. Other commissions include music for Italian National Radio, the Berkeley Symphony, The New York Festival of Song, Relache Ensemble, the Austrian chamber octet Die Knodel, choreographers Pat Graney, Victoria Marks, Aiko Kinoshita, Li Chiao-Ping, Cheronne Wong and Carla Barragan, multi-media performance group Run/Remain Ensemble, UMO Ensemble, and choreographer actor/clown Lorenzo Pickle. She has received grants and fellowships from NEA, Meet The Composer, Civitella Ranieri, Seattle Arts Commission, King County Arts Commission, 4Culture, Washington State Arts Commission, Arts Link, Pew Charitable Trust, Artist Trust, Arts International, and from various philanthropists. In 1996 she received Fellowships from both Seattle Arts Commission and Artist Trust. In July/August 2004 she was a (very happy!) Fellow at Civitella Ranieri in Umbertide, Italy. In 2008, she received the Artist Trust Paul Good Fellowship in Ireland. On New Year's Eve, 2006, her Italian band Quintetto alla Busara accompanied French circus Farfaides in the Piazza del Plebiscito in Naples Italy with 10,000 in attendance, broadcast internationally. She recently completed a 2-year commission from Meet The Composer to compose the soundtrack for Dan Froot and Dan Hurlin's toy theater/puppet piece 'Who's Hungry? - Santa Monica'. This work is based on oral histories of 'food-insecure' people, and was premiered in Santa Monica, California in January, 2012. Fascinated by 'unheard voices', she collected oral histories and created a multi-media performance entitled 'Mythunderstandings' in collaboration with the Tiptons Sax Quartet, Saanich Tribe story teller and musician Paul 'Che oke ten' Wagner, film maker Adam Sekuler and director Lisa Halpern, which premiered in Seattle WA in January, 2013. They are touring this piece in America in January, 2015.  Though mainly self-taught, (both her parents played jazz contrabass) Denio was sponsored by Jazz India to study voice in Bombay in 1997 with Dhanashree Pandit Rai. She has taught workshops on improvisation and composition throughout Europe and the US. In April, 2001, she was invited by Fred Frith to be Rosencranz Artist In Residence at Mills College in Oakland, California. My sister left her guitar behind when she went to college; it was a classical guitar. My first real guitar was a Guild T-50 Acoustic Electric, which unfortunately was stolen while I was in high school. My learning process is principally based on my ear ~ I have always preferred to improvise, and decided to become an autodidact at age 12. I never liked teachers telling me what was right or wrong about music. My mother playing bass while I was still in the womb. When I was 12 I signed up with the RCA Music club, and remember receiving 8 LPs. They included Elton John: Yellow Brick Road, and Alice Cooper: School's Out, and Bachman Turner Overdrive: Greatest Hits. The last record I bought was the vinyl LP of the soundtrack to the cult movie Shredder Orpheus, which I purchased in November. The soundtrack just came on vinyl! I played bass on the recording. To help me express myself in ways that I could never do with spoken language; it is the language of my soul. I see community created at each concert ~ I love that strangers come together to experience something together; and I adore that =music is an international language that serves as a bridge between cultures. I created a soundtrack for modern dance called Tasogare. When I started work on it, I felt tired and in a bad mood. I decided to do the easiest thing; play the note C on the accordion for a long time, and put it through my Line6 Delay Modeler's loop. I played the note C for about 15 minutes, and with the anomalies of the instrument, a very beautiful melody built from the harmonics of the note C unfolded. It was astounding! Keeping the same setting on the looper, I then played G ~ and a different melody with a faster cadence appeared like magic. Same with the note F.
Then I decided to see what should happen with C#; I'd recently heard that it is the most far away from the natural harmonic scale. The result was complete dissonance, using exactly the same settings. My laziness opened up a world of wonder and beauty! It's more fun to play when one has good techniqute ~ and probably more enjoyable to listen to; but I am a strong advocate of intuition in music. To quote my theory teacher Roland Wiggins, 'You gotta learn the rules to break them.' Developing good technique is also helpful for musicians not to hurt themselves physically! What quality do you admire most in an musician? What quality do you most empatize with in a musician? Playfulness. Empathy and good listening skills. The more resonant, the better! One that surrounds your entire body, comfortably. My voice, acoustic & electric guitar, baritone guitar, bass guitar; alto sax, clarinet, accordion, theremin, percussion instruments, my mother's gall stones as a maraca, anything that resonantes. Benefit: Everyone with access to a computer can make music! Challenge: The market is glutted with too much information. Benefit: It's easy to edit, overdub, and create music digitally. Challenge: The synergy of a musician or group playing continuously is a rare experience in the studio! What are your motivations for playing music? Mysterious, beautiful, captivating and playful, all at the same time. To strengthen my intuition, to create community by playing concerts, to create beautiful compositions and improvisations. Also, I sing into people to help them physically; I have had great success singing resonant tones into people with broken bones or recovering from cancer surgery, or stiff muscles. I hope to do more of this, it really works! How would you define silence? And Noise? Noise depends on culture. For example, I love what other people call noise; Noise is that which one does not plan to hear. Here's one: I was at my friends' house in Seattle, improvising on a Monday night. The phone rang, and Jason hung up, sighing, saying 'well these other musicians are coming over, and they only want to play their songs." I figured, ok we'll pass the guitar around the imaginary campfire, I can put up with a few songs. In walked 5 guys from Morocco, carrying Saharan percussion instruments and one banjo instead of oud. They had discovered they all knew the same Gnawa trance songs from the Sahara desert. I ADORE Gnawa music. I played my A on my accordion to encourage tuning the banjo to me, and the banjoist ingored me. They started playing, and I joined in. My accordion sounded perfect with the banjo, and after 10 minutes or so, I felt literally outside of my body with joy. In 1994 I played with Chris Cutler and Wadi Gysi (Pale Nudes) at Westwerk in Hamburg. Much to my surprise, I discovered that the dancing people there were from the band Faust, so I had the honor of meeting some of my heroes. Literally 2 weeks later, Faust played in Seattle, and called me the night before. We drank red wine in their hotel room, we had a marvelous evening, and they invited me to play on one song. The next day, I came to the venue and they showed me the set list ~ they invited me to play on almost every song! They had arranged for a piano; in concert, they destroyed it, Jean-Herve did naked body painting, a metallic structure was constructed around and above the drums, and they had a blow torch, so I was showered by sparks for the entire concert. I figured the usual 35 new music afficionados would come, but instead the concert was sold out. Unforgettable night! Painting: I've collaborated with Croatian visual artist Danijel Zezelj painting live while I played, very beautiful stuff! Literature: I once improvised music to Dr. Seuss' "Butter Battle Book", and also wrote an entire song cycle for Austrian chamber ensemble Die Knodel, based on 'Invisible Cities' by Italo Calvino. Dance: I've been composing soundtracks for modern dance since 1983, received a Bessie Award for my work with David Dorfman Dance, and also performed at the Brooklyn Academy of Music's Next Wave Series with him. Theater: I've composed for various theater ensembles through the years, but prefer other media. Books: The Tuning of the World by R. Murray Schaefer; The Song Lines by Bruce Chatwin; The Ecology of Eden by Evan Eisenberg; Invisible Cities by Italo Calvino, anything by Rumi. Experiences: going on 3 separate solos (staying completely alone for 2 nights and 3 days) in the wilderness as a teenager, living in Ireland at age 16, 'leaping into the void' (i.e. moving to an unknown city) twice. Fred Frith, Stuart Dempster, Jeff Buckley, Dennis Palmer. What would you enjoy most in an music work? If you could, what would you say to yourself 30 (or 35) years ago, about your musical career? Around that time the message was 'you must specialize to succeed'. I remember firmly decided against that, and became a multi-instrumentalist; each instrument paints my one song in a different light. For many years I've been playing in Kultur Shock, a Balkan punk/metal/folk band. The songs are crazy, my band mates are crazy, and our public is completely wacko, especially when we play in ex-Yugoslavia. Or it might be my piece 'The Inadvertent Hacker', which I was commissioned to compose for the Hacker Symposium by the Pacific Science Center. Maybe because my name starts with A, I often receive phone calls from peoples' pockets or bags. I made field recordings of inadvertent messages left for me, and constructed a piece based on the tonalities and subjects of messages I received which were not actually intended for me. I just finished producing the second CD by the most amazingly beautiful Italian sextet OU, and will be putting it out on my record label Spoot Music very soon! In January 2015 I am touring with the Tiptons Sax Quartet & drums in the US, presenting our multi-media piece 'MYTHUNDERSTANDINGS', based on oral histories. In February/March 2015 I am touring Europe for 6 weeks with Balkan punk metal band Kultur Shock, presenting our new LP/CD, 'IX'. In April/May 2015 the Tiptons tour Europe. In summer 2015 Kultur Shock will play festivals in Europe. I hope to take a sabbatical from touring in Winter 2015/2016; I've been invited to teach at Angelo Mai Scuola della Musica for a month, and look forward to having some down time in Italy. I am beginning research and fundraising for the Tiptons to create a multimedia piece about gender perception in the music industry; we have developed a survey to ask musicians, music producers, and music appreciators, and will videotape the responses. We will cull major themes, compose music, and create a multimedia performance with video and live music, working with director Lisa Halpern, and will premiere the piece in 2017. After the success of my Samba/Taiwanese music arrangement and CD production 'Naruwan' (2008), I have been invited to return to Taiwan to work with Amis Tribe teenagers to arrange produce a new recording. I am forming a new ensemble under my own name! It will be a sextet devoted to playing my compositions; there will be trumpet, trombone, cello, bass and drums. I will sing, play saxophone, clarinet and accordion. 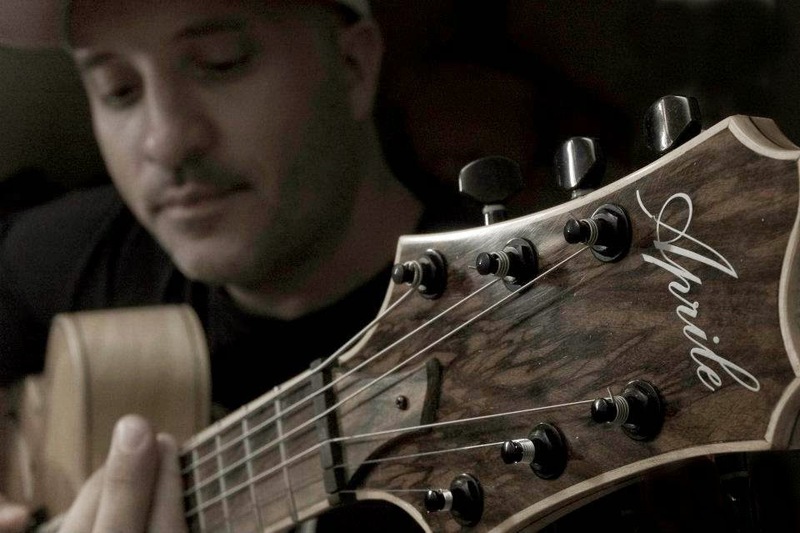 Juampy Juarez is one of the Argentinian most versatile and innovative players of his generation, working in jazz, rock, fusion or heavy metal with equal facility. 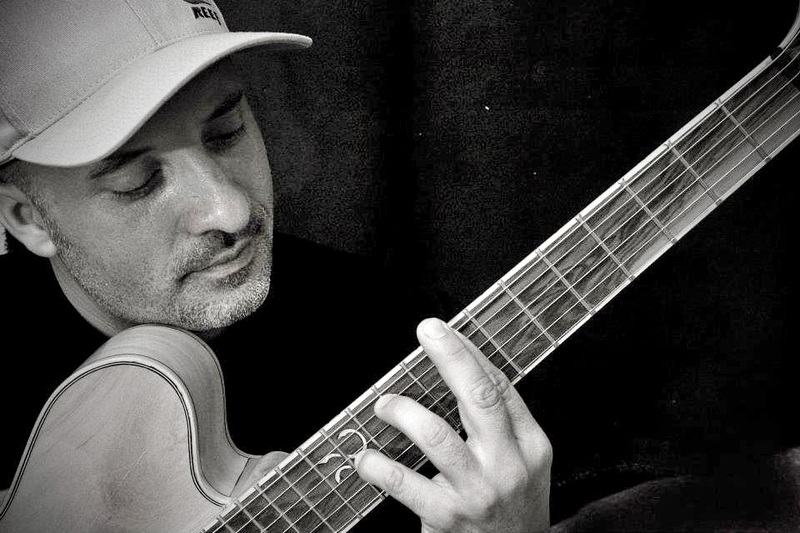 He tooks lessons with Pat Martino, Jack Wilkins, Gene Bertoncini, Jonathan Kreisberg, Barry Harris, Sid Jacobs, Paul Meyers, Bruce Arnold, and his main mentor, Pino Marrone. He has performed around the world, in New York, Buenos Aires, Sao Pablo, Bangkok, Barcelona, Madrid, Girona (Spain), and Paris with the likes of John Stowell, Jack Wilkins, Gene Bertoncini, Peter Mazza, Ben Monder, Howard Alden, Joe Giglio, Tony De Caprio, Russ Spiegel, Pino Marrone, bassist Steve La Spina, Sid Jacobs, Sheryl Bailey, Jim Silverstein, Dan Adler, Tosh Sheridan, Matt Butterman, Tony Romano, Marco Opedissano, Rick Stone, Jim Hershman, ex- former Pat Metheny group singer and composer Pedro Aznar, Paul Meyers, trombonist Jim Masters, bassist Thomson Mckneeland, Tom Dempsey, Joe Berger, Israel alto sax player Gilad Atzmon, Matt Askinazof, Eric Leboucher Radiguet, Luis Sanchez Trio (Spain) among many Argentina top stars like Los Piojos, La Renga, and Ciro Martinez, Axel, and Luciano Pereyra. He played in the most importants venues of Buenos Aires, as wordly famous Teatro Colon, Rock’s temple Cemento, and jazz clubs like Jazz&Pop and Thelonious Club. In NY, he have been playing at the 55 Bar and Bar Next Door. Juampy has been teaching for the past 25 years, privately and at different universities from Bangkok to Buenos Aires. He is a clinician too, and writes lessons for music’s magazines. 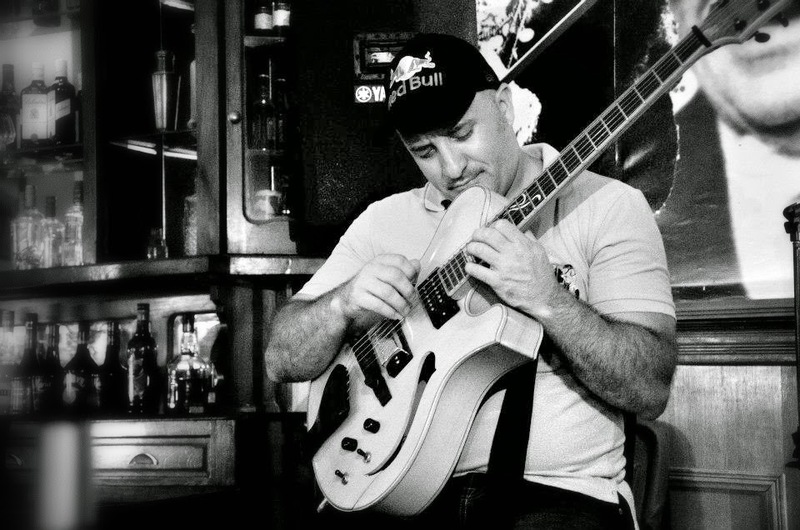 He has written three books called “Contrapuntal Improvisation”, “Guitar Explorations”, and “Improvisacion avanzada III”.In these books, Juampy shows his investigations, new devices and own variations on Jimmy Wyble’s techniques and dodecafonic/Atonal stuff, Fibonacci’s series and beyond.His main musical project is Powerjazz trio; the group has 2 recorded cd’s(one with John Stowell like a guest)and one dvd.Juampy also has a guitar-piano duo playing original 12 tone and atonal music with one cd in the streets. 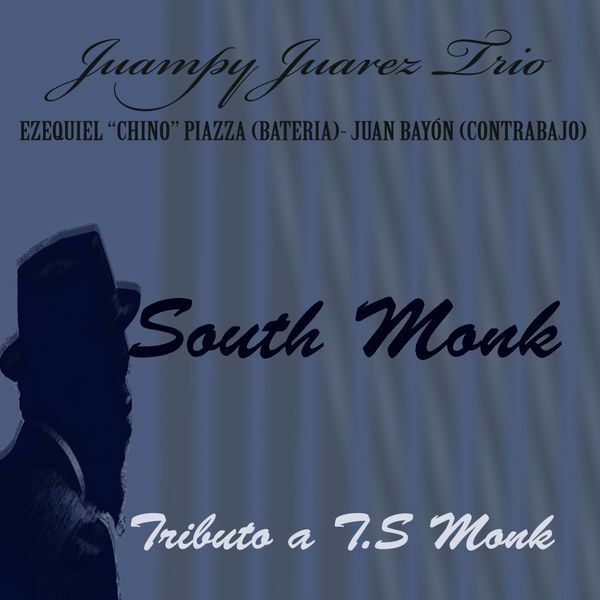 His latest project is the Juampy Juarez Trio, with Chino Piazza on drums and Juan Bayon on bass, two of the best South America’s jazz musicians.They recorded together South Monk a new CD paying homage to legendary composer Thelonious Monk. 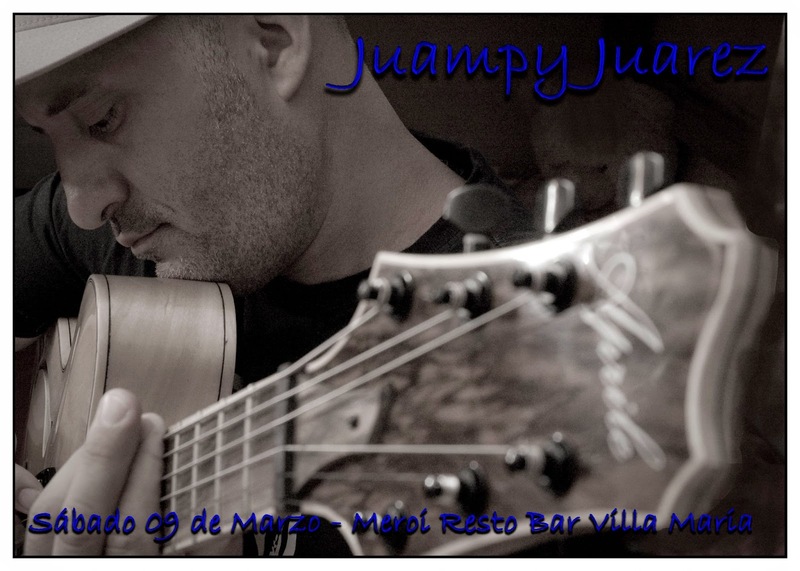 Juampy’s duo with piano player Fernando Pugliese, called simply ”Standards”, pushing the limits on this genre, with innovative harmonies, intriguing dialogues and interplay between piano and guitar. Both available at www.cdbaby.com. Juampy also has a guitar-piano duo playing original 12 tone and atonal music called Praxis that already has one CD on the streets. 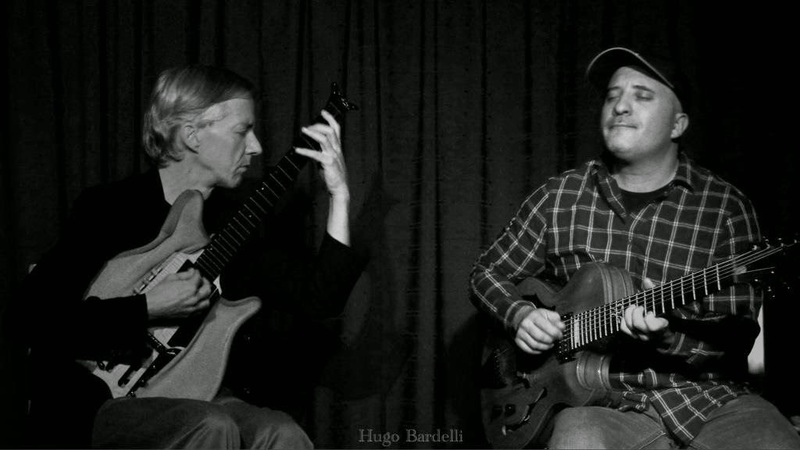 Also a guitar duo con great American player John Stowell, with two CDs, one in a quartet setting and one duet called Games and Gems, using counterpoints and interplay, a moden jazz duo guitar that has excellent comments among musicians. Juampy Juarez is endorser of Di Marzio pickups, Hamer Guitars, German Aprile Guitarras Artesanales, and Argon gigbags. My first guitar was a gift from mi mom for my 13th birthday, it was made in Argentina nylon guitar, "Armoniosa" bears his brand inside it, and practice with this one many years, was a really cheap guitar made with fake wood in his body, and his strings were one mile far away the neck, but thanks to it help me to develop a good technique, lol. Barely I can remember it, but I think that was "Unmasked" a kiss album when I was ten. My last one was a solo album by my friend Gene Bertoncini. I expect for music that it continues transforming this world in a better one, helping people to get more spiritual and less material or consume oriented. But the problem it's no music, actually creative music needs more channels to massive audience, and not keep in secret for musicians only.It's no artist's fault, if not authorities and businessman owners of TV channels, radios, newspaper etc, etc. My last albums, my trio album"South Monk" tribute to legend TS Monk, available at Itunes, Amazon and Spotify, edited by neworldrecords, and my duo album called "Standards" available at www.cdbaby.com surprised me, the first one, because we already recorded in 4 hours, and it was very group inspired, courtesy of titanic players Juan Bayon on bass and Chino Piazza on drums, with almost no overdubs, with risks, it swings and sounds contemporary, and the second one, because the counterpoints in it, floating around piano player great Fernando Pugliese, I think that I discover my own language for comping and in this record you can listen it. Technique is important only for let talk your own heart, for let your feelings and emotions get away from you to the audience.Technique is a tool, and never a goal.Sadly, in the days that we live, it's looks inverse. I admire from musicians in first place TONE, the risk, the rhythm, the melody sense , and the capability of storytelling when he improvise and compose. I admire musicians that become an artist, the innovator, then and icon, like Coltrane , Ornette, Hendrix, Beatles, Zeppelin, Piazzolla, Schomberg, Bartok, Wagner, Beethoven, Bach, Miles, Parker, Bill Evans, Shorter, Holdsworth, Ravi Shankar, and many many others. A good instrument let you playing inspired, with the harmonics resonating and with a full , warm tone, a comfortably neck it's a must, and for me, I like guitars that were build for work, not for a museum or for take too much care.When you tour, or are gigging a lot around your city, many times it crash against things, and it have to resist it, I don't like guitars that looks like gems. Digital scene help to spread creative music to places that was impossible to difund, when I grew up in Buenos Aires, it was almost impossible to buy many albums, so you have to somebody to import it from The States or Brasil. Now it's to much easier, but the bad part it's that many mediocre or less than it wanna be musicians are uploading videos and music to the net so the good music and the bad music walk together there. I always look for a warm, fat sound rich in harmonics, with sustain and clear for chords. Now I'm using a DDL4 delay, a Radial Tone bone for a little distortion, it has a warm sound, I just add it for sustain, because I'm using an archtop.A Morley volume pedal help me with expression and Boss Octave, complete my tone-palette.I want that somebody invent some pedal for sustaining chords and note with no distortion, but this dream never become real until now. How would you define silence? I agree with Miles that silence it's the most louder sound. And I look it for the music that I love, every time.Riffs and melodies with space rules, at least for me. I play music for tell people that who I'm, no other language or discipline tell more about me that music.I love music to the death, it changed and saved my life, helped me to be a better guy, and teach me something different every day. I discover something new almost daily, so I live happy being a musician. I can't think in a better life. I played in Bangkok, Thailand for 4 and a half months, in a five star hotel, playing for Kings, ambassadors, famous actors, sharing licks with people from all around Asia and Europe. Playing with such legends as Howard Alden, Ben Monder, Steve LaSpina, Jack wilkins, Gene Bertoncini, John Stowell, Peter Mazza, and many others fantastic guys too.I love to share music with people from another cultures and countries. I put my feet in the five continents. I'm a lucky guy. Sid Jacobs Guitar, Juampy Juarez Guitar, Ezequiel Piazza Drums. 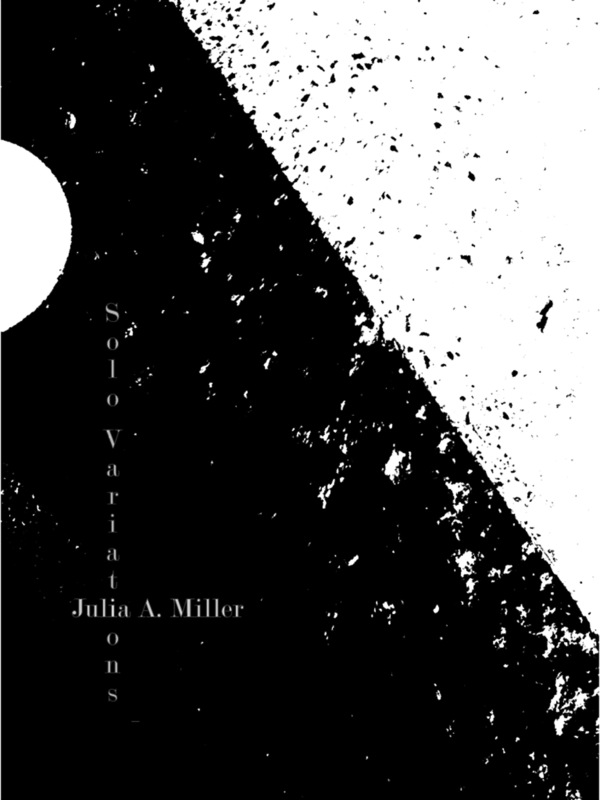 Julia A. Miller is a sound artist, guitarist, improvisor, composer, visual artist, curator and educator. 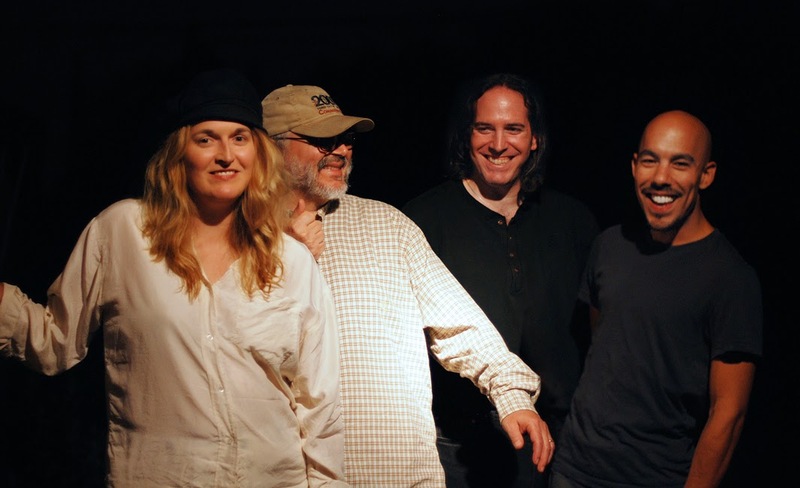 As a guitarist, Julia performs with Volcano Radar, a fusion of ecstatic improvisational energy and apollonian intellect. a power quartet with dual free jazz/noise/avant guitarists with Elbio Barilari along with Edward Wilkerson Jr., Rollo Radford, Harrison Bankhead, Tim Davis, Lou Ciccotelli, and Avreeayl Ra. 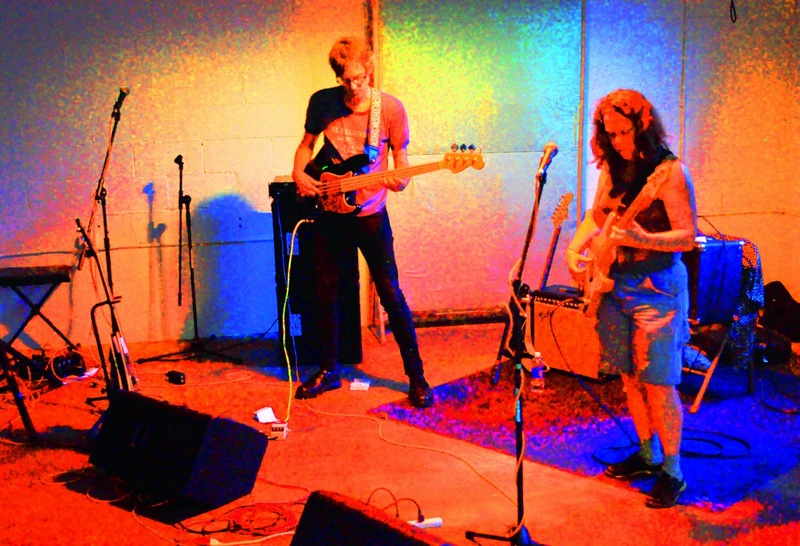 Volcano Radar moves fluently through a stylistic range from noise-funk improvisation to structured sonic forms. 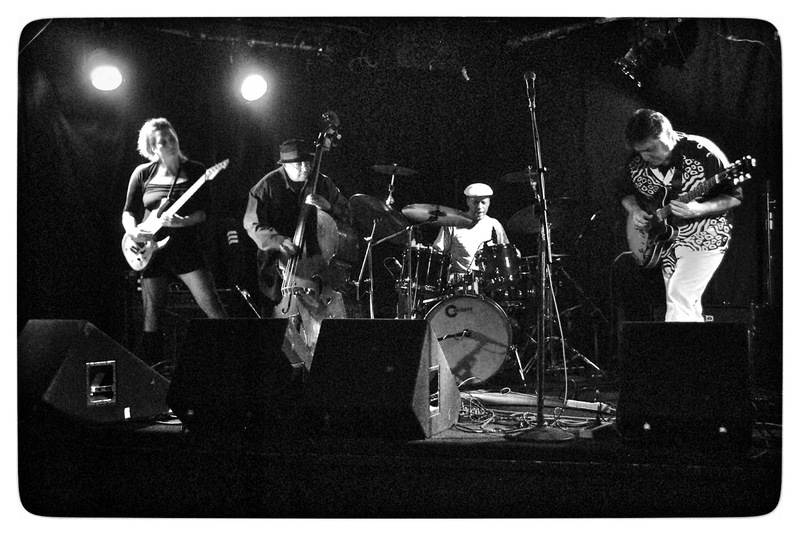 In 2013, the quartet released the digital EP "Refutation of Time" on the Chicago ­based netlabel Pan Y Rosas. Julia has performed with the electroacoustic trio Auris, with Eric Leonardson and Christopher Preissing, a Chicago-based collective that performs original music on traditional, electronic, and self-built instruments. Founded in 2007, its performances employ free improvisation and non-traditional scores in the exploration of electroacoustic sound as an organic art of time and space. 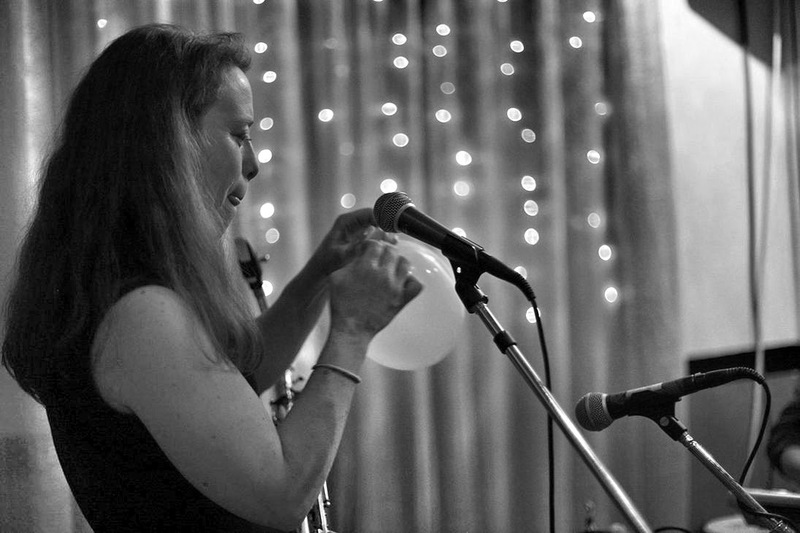 Julia has also performed with Gimlet Eye, Frank Abbinanti, Julian Berke, and Nick Alvarez; and with HKM, with Mark Hardy and Reid Karris, and she's a frequent soloist and collaborator in experimental and avant garde chamber music. In 2012, Auris released the cd "Rub" with Gino Robair on Pan Y Rosas and Public Eyesore. Also in 2012, Julia was asked to participate in the $100 Guitar Project, a double cd release of improvised and composed short pieces by 65 different guitarists which was released on Bridge Records with proceeds benefitting CARE. Also in 2012, a live recording of her solo performance on the Experimental Sound Studio's Sunday Solos series, titled "Solo Variations", was released as a digital EP on the Chicago netlabel Pan y Rosas. Julia is a founding member of the Chicago Scratch Orchestra. Center (SAIC), and continues with an internet radio show on numbers.fm. "Articular Facet with jseq_a". In 2014, Articular Facet has become a formal collective. Articular Facet now functions as an open-culture collective of accomplished working musicians and artists willing and able to push boundaries and experiment with ambitious long term and large scale works- new forms of opera that fit the original definition of a significant work. We're interested in works that bring together multiple media and collaboration for the sake of the articular process, so stay tuned for updates on member works and future large scale projects. Also in 2011, Julia served as the music curator for Collaboraction's Sketchbook Festival at the Chopin Theater, programming over 20 concerts of live music within the theatrical setting. 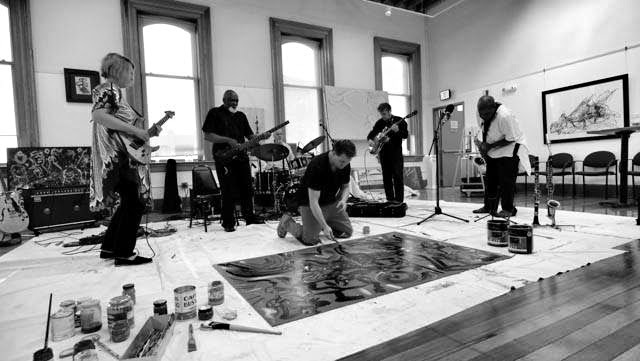 In 2012, along with noted sound artist Eric Leonardson and composer Christopher Preissing, Julia curated the Make Sound Festival for young artists at the ZhouB Center in partnership with the Wet Paint exhibition curated by Sergio Gomez. Julia is a former curator, along with founder George Flynn and composer Jeff Kowalkowski, of the New Music at the Green Mill concert series. She is also a member of the Chicago Composers Consortium (C3), and was instrumental in the technical organization of the Chicago Composer's Forum's production of John Cage's Musicircus at the Museum of Contemporary Art in 2004 as well as performances of Cage's Variations V and VI in Chicago. As a composer, in 2013 the flute and percussion duo Due East will premiere the commissioned piece "c_nz_n_". 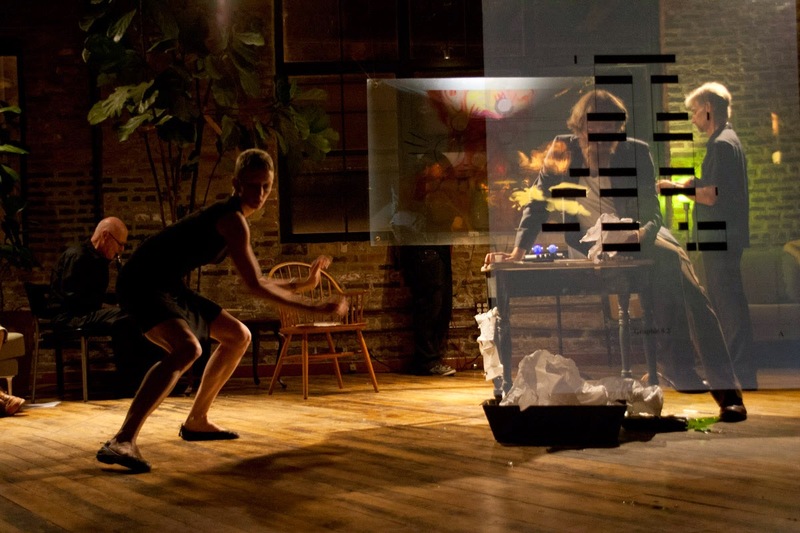 In 2012, Julia partnered with Bay area composer and improvisor Gino Robair on the Improvised Opera Workshop at High Concept Labs which saw thirty improvisors tackle the combined operas of Miller ("Dissecting Adam") and Robair ("I, Norton") in an immersive setting with interactive scoring and video. Julia is Guitar Professor at Carthage College, an Adjunct Assistant Professor in Sound at the School of the Art Institute (SAIC) in Chicago, and is the Guitar Dept. Head at the Music Institute of Chicago (MIC). Julia received a DMA in composition from Northwestern University in 2005. As a composer, Julia is active with the Chicago Composer’s Consortium and New Music Chicago, and her ﬁrst cd of acoustic chamber music will debut on the Southport Composer’s label in 2010. Julia’s music has been performed by artists including guitarist Fareed Haque, piano trio The Lincoln Trio, guitar and mandolin duo Ahlert & Schwab, and sopranos Toni Arnold and Julia Bentley, and has been featured at such festivals and venues as the Aspen Music Festival, May In Miami, the Accademia Musicale Chigiana, the Museum of Contemporary Art in Chicago, Depaul University, Northwestern University, and Oberlin University, as well as rock clubs, cabarets, bars and alternative spaces internationally. She has received awards and fellowships from the Chicago Tribune Foundation, the New York Art Ensemble, the United Arts Council, the American Composer’s Forum, and Meet the Composer. Currently a member of the composition faculty at the Music Institute of Chicago. Volcano Radar with reedist Edward Wilkerson Jr. and visual artist Lewis Achenbach on the second Jazz Occurrence. As an electronic musician, Julia recently completed a sound installation for the Florasonic program at the Lincoln Park Conservatory sponsored by the Experimental Sound Studio. In 1998, Julia was a ﬁnalist for the Gaudeamus Music Week Composition Competition for the acousmatic work “bluu”, and also presented that same work at the IRCAM Forum in Paris. In 2008, Julia received a premier of a new work for 5.1 DVD and video titled “artists go from unknown to mainstream overnight” at the Electronic Music Midwest Festival. My first memory of the guitar is seeing a KISS poster at the local grocery store; I was 5 years old. The band's makeup and costumes were definitely dramatic, but I vividly remember paying attention to the fact that they were playing guitars in the picture. I began bugging my parents, and they finally got me one for Christmas when I was 8, a 3/4 size steel string acoustic, "The Drifter"; I still have it. …the musicals and atmosphere of my Grandfather's dinner theater …midwestern marshes, rivers and lakes near the small town where I grew up…70s hard rock/heavy metal, particularly Mott the Hoople and Iron Maiden …Dixieland clarinet music performed by an older family relative. My process was, and is, a combination of the visual, visualizing the conceptual, altering and adapting the physical, and listening to living models. I didn't focus on the technique of learning specific, non-classical, solos by ear or transcription until much later. As a result, my solos still tend to be textural, noisy, downright atonal or "out". This could be challenging, because often the feedback I got was that I was "doing it wrong" until, farther along in the process, the solos weren't "wrong" anymore and became "right". Today's digital music scene can be a paradox of self-contradictory extremes in distribution and resolution. For example, on the darker side of mass distribution, a huge internationally known band recently imposed its music on listeners without their previous consent, via one of the main digital media applications. In the same week, an international male pop artist made a controversial choice by ignoring conventional distro outlets and releasing his latest record through paid file-sharing. While the 8 seconds of noise accidentally released by a young female pop tart gave her more discussion in the noise/art scene - if only as a joke - than she ever dreamed of (or deserved). Conversely, the Free Music Archive has been a huge benefit to independent artists in terms of distribution, though physical media will also always be an important part of an artist's practical output. Auris's second record, "Rub", my "Solo Variations" recording, and the first Volcano Radar recording, "Refutation of Time", were all digital releases. However, the Auris record was a dual release between Pan Y Rosas (digital), and Public Eyesore (physical), and Solo Variations was also mixed for future release on LP. The possibility to release high-bit rate mp3s and lossless digital files is accessible to all, and some established artists have developed their own physical hardware along with proprietary platforms to release digital files or have partnered to helm existing digital media streaming services. Large scale online radio streaming doesn't seem to be a smart direction for artists, because the artist loses control over (and revenue from) their work; though it's possible to establish a DIY radio station like Chicago's numbers.fm or to set up paid "name-your-price" digital downloads. Dissecting Adam, a chamber opera project by Julia Miller slated for 2012, relates the existence of an 111 year old woman whose life spans three centuries, having been born in 1899 and dying in 2011. Her story is interpreted by five female voices who individually represent eras of the woman's life, providing a skeletal frame for the exploration of the evolutionary archetype through the woman's relationship to the male figures in her life (collectively known as "Adam"). Her lifetime provides the construct for artistic collaboration and exploration of other themes including (but not limited to) the word play on "adam" (human being, here translated as man) and the feminine "adamah" (ground, soil), and the ancient Chinese practice of using oracle bones for divination. Articular Facet is a series of performative and technical explorations of Dissecting Adam and other large themes. At age 8, I started lessons with a lady whom I adored, but who was primarily an accordion teacher. 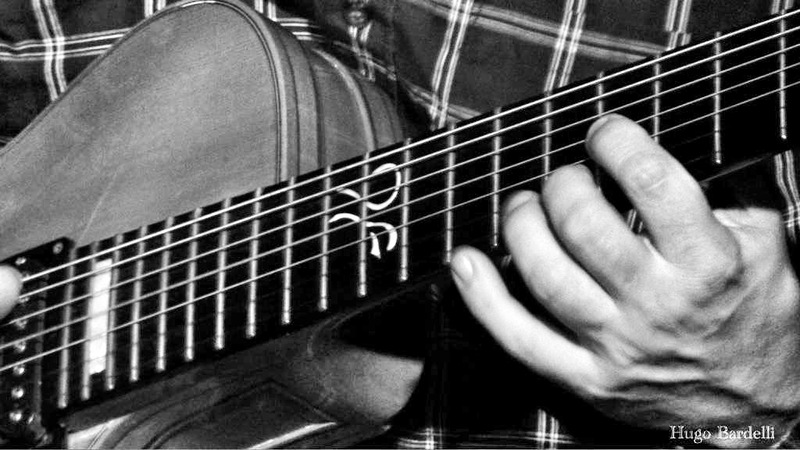 We studied mostly flatpicking with method books. That same year, I gave my first public performance, on my (other) Grandfather's Martin ukelele, playing and singing "Yes, Sir, That's My Baby" and "Bye, Bye, Blues". I still know and teach these tunes, and I still have that uke. I also appeared in a musical, singing a duet, in the aforementioned dinner theater… The next tunes I learned and performed in public were "Hard Day's Night" by the Beatles, and "Bad, Bad, Leroy Brown" by Jim Croce (I was probably 10 and was as thrilled by Leroy Brown as Jeff Parker seemed to be in his interview). I learned the chords to both of those tunes, but the Croce was the first recording I remember listening to specifically to learn the melodic phrasing. In junior high, I graduated to a classical guitar teacher, who helped me find my first real classical guitar, a Yamaha. I still have that instrument, too. The guitar, and the teacher, were… decent. I came to him with my first "electric guitar solos learned by ear" - "Stairway to Heaven" and "Dream On" - and he taught me movements from the Robert de Visée Suite No. 9 in D minor. A fair trade. Meanwhile, my cousin, the clarinetist, had influenced my mother to start me on that instrument, in addition to the guitar, whilst making me cassette compilations of recordings by Tal Farlow. I performed with my cousin in summer bands, and played Sousa marches at 200+bpm with a circus band. My clarinet teacher, who challenged me more than the guitar teacher at that point, gave me the first movement of the Mozart Concerto and the Solo Sonata by Paul Hindemith. The Hindemith was hugely important for my sense of interval and voicing, which I transferred to the guitar and later to composition. I also performed the introductory solo to "Rhapsody in Blue" with an orchestra. The concept of extended techniques besides the written notes, such as embouchure glissandi, and listening to performances in depth for phrasing and articulation evolved from that experience. The first jazz tunes I learned to play were "So What" and "All Blues" by Miles Davis. I was 16, and spent time at a summer jazz camp. Though, I have to say, those tunes and the Tal Farlow recordings didn't really take effect or sink in until much later as a guitarist (I did use motives from "All Blues" in an experimental score in my early 20s, though, which later became the chorus to my opera)… …at that time, as a teenager, I owned a really beautiful hollowbody Epiphone - one of the few instruments I don't still have, and the reason I learned not to sell guitars if at all possible, unless they have something seriously structurally wrong with them or have inherited bad vibes. In college, I double majored in classical guitar performance and composition. Finally, I ended up with a double BM, double MM, and, ultimately a DMA in composition. In undergrad, there was - at last - a real classical guitar teacher who was, by far, the best guitarist I had known "in real life". Also, in undergrad, I bought the first electric guitar I really played; a sea blue/green Kramer, classic 80s - locking nuts, Floyd Rose tremolo - purchased from a dude, who seemed much older at the time but was probably only about 23, whose girlfriend was making him sell it so they could settle down. He made me promise to play it. That guitar became the first guitar I adapted, prepared, and installed a MIDI pickup on. It was used in the noise/timbre trio Auris, where I tuned it down relatively to low B to match the resonance of Eric Leonardson's springboard. The second electric I adapted was a black Mexican Strat which had something of a history in DIY Chicago bands. While the Kramer's wandering pitch center worked well with Auris, and became a feature in that group's improvising techniques, the Strat could actually play fretted notes in tune. Later, I had the Jeff Beck tone mod done on it, and also had the tremolo set up like Beck's - in order to play scalar notes with the tremolo bar. I contemplated building my own "ultimate art guitar" but realized what I wanted was an instrument that would elevate my electric playing, taking it to a new level, and one that I couldn't build on my own. For several years, I made lists of features, diagrams of instruments, chose wood, and finally found a luthier willing to build what I wanted. Recently, I completed an amp to pair with that guitar, a 50w tweed Twin. In the early 90s, I began attempting to use a computer with the guitar. The inability of the processors to cope lead to my interest in interruption and "glitch". This also evolved into triggering videos with my sound improvising. For immersive or multichannel sound, I occasionally use this special breakout box with my MIDI pickup, routing each string to its own channel. 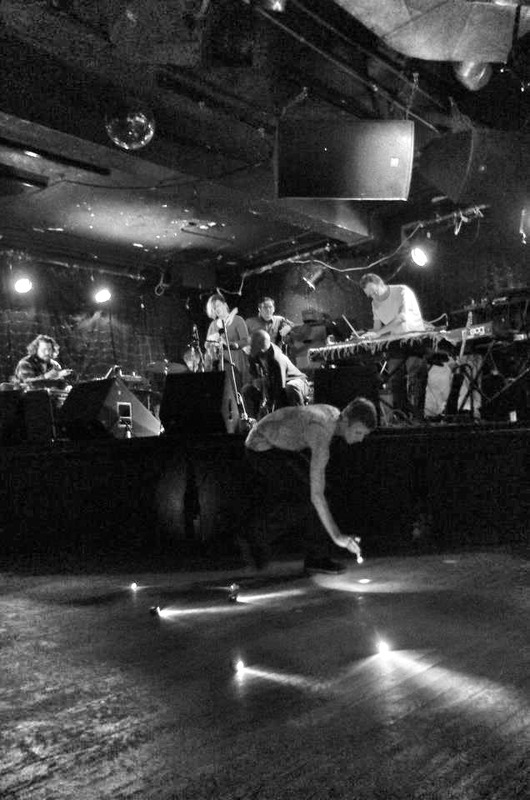 Recently, the opportunity to play and collaborate with free jazz musicians in the context of Volcano Radar has been a dream; that band has been and will be the catalyst for large composed and improvised performances. Julia Miller performs "Harrow/Dormant", a graphic score by Noé Cuéllar. Live from Transistor, Chicago (February 2011), as part of Articular Facet 1. What would you enjoy most in a music work? Have the confidence to truly focus on your own playing in a public way (not only in a private way), and be okay with calling positive attention to yourself. Dissecting Norton is a live combination of two improvised operas following independent graphic scores: Dissecting Adam, by Julia A. Miller, and I, Norton, by Gino Robair, take the shape of improvised collages governed by graphic timelines. They combine the use of hand cues, graphic scores, memory-based improvisational structures, and traditionally notated music. Out of a couple dozen instruments, there are three guitars that I use most: Todd Keehn electric/MIDI Guild Starfire S4 semi-hollow Barranco classical guitar Amps: Vintage Roland Jazz Chorus 120 Handmade 50w Tweed Twin stereo or quad PA Various pedals (handmade/mods/commercial) in my pedal board MIDI pickups GI-10 MIDI interface JV-1010 Roland sound module things I carry in my guitar case: threaded metal rod to use like a bow ebow steel slide ceramic slide various picks metal nail files and sandpaper contact mics and inductors, sometimes a mini .5w amp strings: coated for the Keehn; light tops/heavy bottoms for the others. 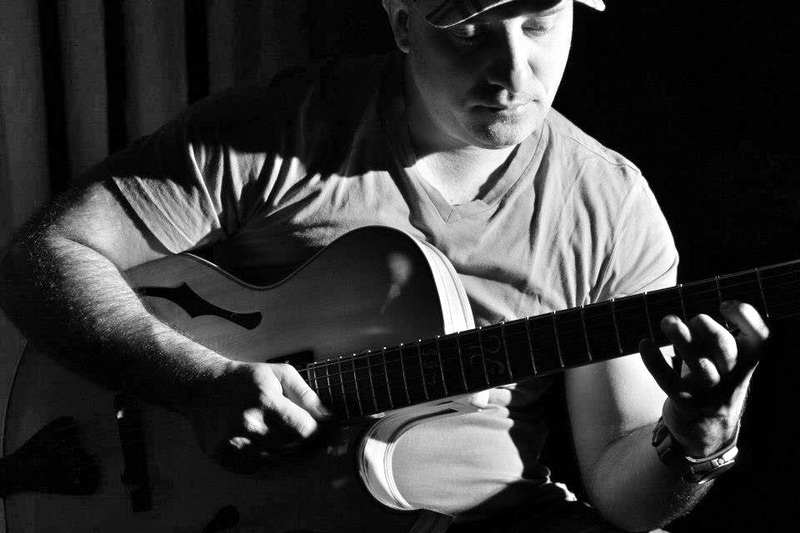 It's not that I "like" being a musician, it is simply what I do. We are mixing a new Volcano Radar release, consisting of live recordings of improvised performances by the band made since August 2014. I was asked to write a concerto for electric/MIDI guitar, classical guitar trio, and large (200 player) acoustic guitar orchestra for performance in 2015. It's also about time for a new solo record.